Yesterday, the gouden koets or golden carriage of the Dutch Queen, Beatrix, went through the streets of The Hague. It is an annual procession. 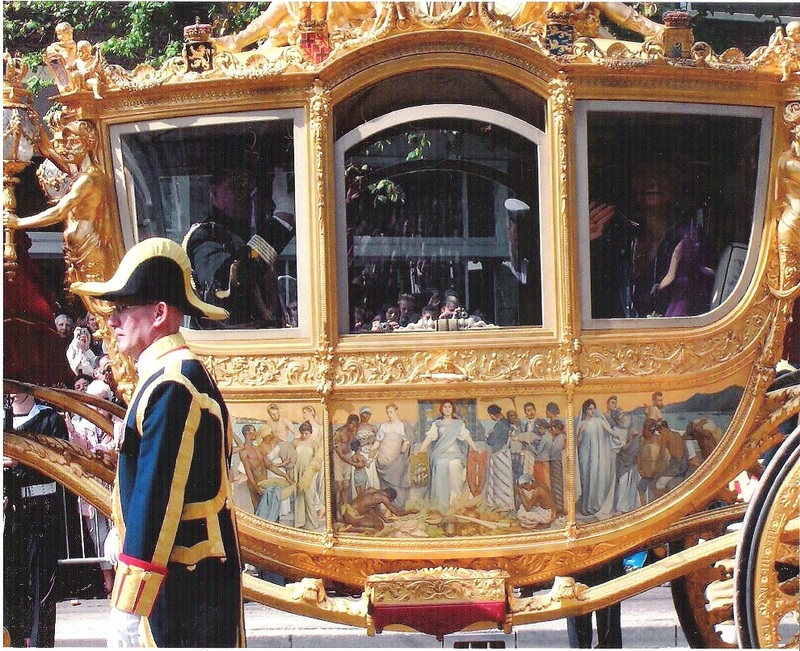 The carriage is used by the Queen from her royal house to the parliament building, to speak in front of legislators. Give me everything you have, and I’ll give you this book. Aren’t I nice? I first heard about it last year, when I interviewed Jeffry Pondaag, the Chair of Yayasan Komite Utang Kehormatan Belanda (yayasan K.U.K.B. / Dutch Foundation Committee Debts of Honor), for the Rawagede massacre lawsuit. The newspeg had already over so I did not write anything about it. However yesterday morning, Pondaag sent me an e-mail. Attached with it were a press release, a letter to the Prime Minister Mark Rutte and Queen Beatrix, and pictures of the carriage. I wrote a short report about it for Tempo. Personally, I still think it’s one of the loose ends that thorn the relationship of most ex-coloniser countries with their ex-colonies. Some people choose to not fuss about the past, but I believe it would be better if (bad) incidences of the past are recognised and embraced as lessons learnt to build a better future. Indonesia itself is far from perfect and still have to deal with a lot of human rights abuses which cost priceless lives, such as the anticommunist purge in the late 1960s, repression against the Acehnese and Papua people, the US-approved invasion to Timor Leste, as well as 1998 kidnappings and killings. The letter to Rutte and Beatrix, in my opinion, is interesting and deserves to be read by many more people. Particularly, the part which states that the Netherlands now is not the one back then, that slavery and colonialism is now crime against humanity, that they should learn from the Germany, and that the panel should be kept inside of museum. So I pasted some parts of it below. And in case you need their contacts, I include their numbers at the end. Enjoy. We: The National Platform Dutch Slavery Past and the Foundation Committee Honor of Debts, ask your attention for the following. Soon, on September 18th the Golden Carriage will ride through the streets of the city of The Hague again. Thousands of Dutch citizens and tourists will visit the Royal residence again to catch a glimpse of the Queen and her relatives. The Queen will in turn ride again in her Golden Carriage: the symbol of the Dutch Monarchy wherein, through the painting on the Side Panel of the Carriage, the criminal colonial history of oppression and exploitation is being glorified. In 2011, the National Platform Dutch Slavery Past and the Foundation Committee Debts of Honor, supported by the Members of Parliament: Harry van Bommel (Socialist Party/SP) and Mariko Peters (Greenleft/GL) made critical remarks regarding the painting on the Side Panel �Hulde der Koloni�n� (Tribute to the Colonies) of the Golden Carriage. This, with great amazement of many Dutch people, including: politicians, intellectuals and journalists. The responses were very outraged. Some people have indicated that they never have noticed the painting before. Prime Minister Rutte mentioned the critical remarks “bizar”. 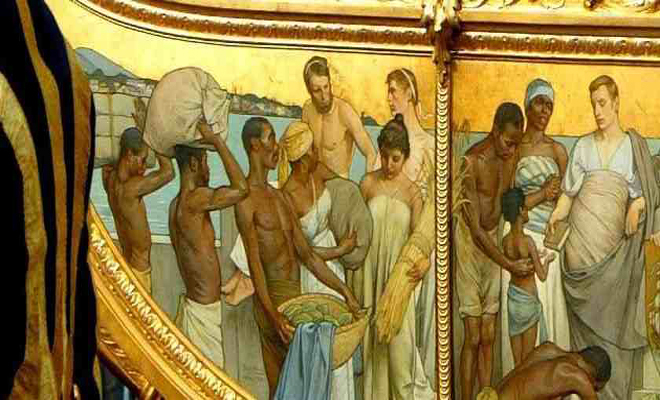 Some critics and historians have indicated that the offending painting on the Golden Carriage should be seen as expressions of a part of the legitimate Dutch history, for which a nation, which apparently is meant, white people, does not have to be ashamed. Meanwhile the people in the Netherlands are no longer �white� civilians only. But they also consist of descendants of the victims of the Dutch Slave Trade, slavery and colonial Past. The critical remarks in 2011 were also seen in the perspective of the “UN International Year for People of African descent� that was declared for 2011. We consider it as an excellent opportunity, within the frame of the UN Year, to bring up this issue of the Golden Carriage, into discussion. But also from the believe that the Netherlands as a civilized country, have transcended the stage of the Colonial Past and from the awareness of the Netherlands as a Multi-ethnic society, where the morals, standards and values deemed to have been changed. And for that reason there should be no place for the glorification of expressions which have their basis in racist ideologies, oppression and exploitation. The signers of this current letter, on behalf of their constituencies, just like in 2011 deem, that in the time in which we are living now, the half-naked African and Indonesian men, women and children on the Side Panel, whereby they are offering goods to the �slaveholders�, which are produced through �slave labour� is still inappropriate, insulting and disrespectful to the civilians of African and Indonesian origin in particular. It is offensive and disrespectful to all people of African and Indonesian descent anywhere in the world. The Side Panel ‘Tribute to the Colonies’ is evoking strong counter-pressure for a large group of citizens in the Netherlands, both of African and Indonesian descent and other citizens of Good Will and solidarity. 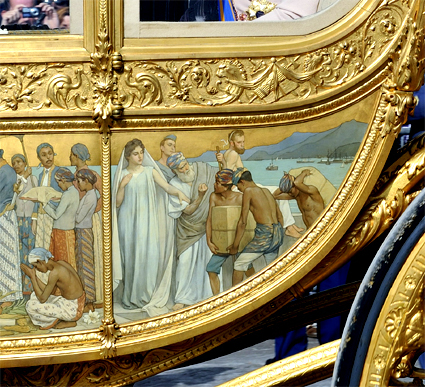 Every year that the Golden Carriage is riding with the relevant offending Side Panel, the painting evoked memories of a horrific period in Dutch history by maintaining the permanent indication, to the African and Indonesian community in the Netherlands, that they are and always have been inferior human beings. Perhaps one of the reasons why the descendants of the Dutch despicable past still have not been offered apologies, while in 2001 (Final Resolution of the UN World Anti-Racism Conference in Durban / South Africa) The United Nations have declared all practices relating to the Trans Atlantic Slave Trade, Slavery and Colonialism as a crime against humanity. The benefactors, the “Association of the People of Amsterdam’ (Vereeniging van het Amsterdamsche Volk�), could not have suspect in 1898, that 103 years later Slave Trade, Slavery and Colonialism would have been declared as crimes against humanity. In the colonial period and the aftermath of the Slave Trade and Slavery a picture as challenged indeed seemed to be quite common. The general civilization in the Netherlands: norms and values, was not in that stage to realize that oppression and exploitation of entire peoples were crimes. On that time there was no awareness that once the Netherlands should be a Multi-ethnic country. As the Netherlands could take an example by the British Royal House it should be every reason to the Dutch Royal Family from the point of view of human rights and the human dignity in mind, to replace the offending painting on the Side Panel of the Golden Carriage by a painting which refers to the Dutch Multi-ethnic society. In Germany, all expressions that glorified the crime against humanity are banished from public life. This says a lot about the level of civilization of a nation. The Netherlands is 150 years too late! Excellencies, Prime Minister, ministers and members of the respective Second Chamber Committees. We are ready to think positively with you. We are ready to discuss with you about alternative painting for the offending Side Panel of the Golden Carriage. What we have in mind is a painting that portrays and reflects on the Multi-ethnic character of the Dutch society. We are convinced that the launching of a national competition towards Dutch visual artists to develop an alternative painting, will realizes many good responses. Right now visual artists in the Netherlands but also from abroad are eager to contribute. – To discuss the ideas with Her Majesty the Queen in respect of the launching of a national competition, in which Dutch visual artists are call on to realize alternative ideas to replace the offending painting on the Golden Carriage. We realize that because of the Dutch parliamentary elections it could be that between the sending and delivery of this letter, a different composition of Cabinet, Parliament and Second Chamber committees has took place. We assume that this correspondence will hand over to possible successors. We are looking forward to your response and an invitation to discuss other alternative ideas with you. Africa Bahasa Indonesia colonial ties colonial wound Dutch golden carriage gouden koets painting panel post-colonial Queen slavery The Hague The Netherlands yayasan K.U.K.B. hmm, very nice article. i don’t think that the dutch is 150 years behind the germany, because they use it to commemorate their glory among their subordinates, especially Javanese in the right side on those golden carriage. I am javanese and i am offended just by seeing that picture. but as you said, we must accept it as we must accept the indonesian-american invasion of timor timur. I hope in a future we can take our own pride by wearing that batik sarong not as subordinates of the dutch but as one of the most civilized nation or people on earth. @Hertady, still, the painting is so irrelevant right now. Yes as it’s part of history, I agree that the painting shouldn’t be destroyed and it should just go to the museum. That’s it. I’ve seen many paintings about the colonial past in the museum and it’s fine, we all learn new stuff in the museum. Otherwise, the painting is so offending as a glorious public display by the Royal King on an annual procession. No offence to you, but to illustrate it in an analogy, would you imagine yourself riding a car, with a painting of your relatives glorifying & ignoring the massacre and slavery against any other human beings?